SR154 MILLS NATURAL RESOURCES DEPT - Requests the Department of Natural Resources to study potential solutions that may mitigate spoil banks created as a result of the construction and maintenance of pipelines. 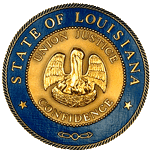 SR159 ALLAIN MINERALS - Requests the Louisiana State Law Institute to study and make recommendations regarding the classification of mineral royalties for the purposes of bankruptcy proceedings. HB689 MARCELLE WATER/RESOURCES - Requires semiannual ground water reporting and parliamentary procedures for certain ground water conservation districts and regional bodies. Presentation by the Department of Wildlife & Fisheries on invasive species.